Tasers (acronym for Thomas A Swifts Electric Rifle) are stun guns used by the police to subdue suspects. 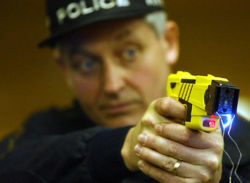 Policeman aiming a Taser Gun. The battery-powered device shoots an electrode, attached by a wire to a capacitor, which delivers a powerful electric shock. The taser is used to subdue suspects who resist arrest, as well as for personal self-defense. It is favored by people who want to subdue a suspect or assailant without killing him, but is opposed by some people and liberal groups (like Amnesty International and the ACLU). In rare cases, being shot with a taser has resulted in death. These deaths are often attributed to excited delirium, a heart condition, drug use or mental illness. This attribution has been controversial, because "excited delirium" is almost never diagnosed outside of police custody. YouTube has some videos of young men resisting arrest, getting tasered, and then claiming the police used excessive force or abused their authority. ↑ The Trouble With Tasers - What The Manufacturer Doesn’t Want You To Know 7 March 2007 CrunchGear. Accessed 5 January 2008. Michelle Malkin blog entries show that the student had rushed toward the stage and cut in line to ask his question, his mike was cut off when he said a dirty word, etc. Speedin Ticket Taser - The officer orders the man to put his hands behind his back, and pulls out a taser. The man refuses, says, "What the heck is wrong with you? ", and then walks away while reaching toward his pocket.